Be the first to share your favorite memory, photo or story of June . This memorial page is dedicated for family, friends and future generations to celebrate the life of their loved one. June E. Brown, Age 83, passed away peacefully Saturday March 23 at her home with her loving family and friends at her side. Born in Berlin, NH, October 11, 1935, she was the only daughter of the late Jasper B. and Helena Leger Brown. June was raised on a dairy farm in Jaffrey, NH before moving to Newton, MA and then Billerica in 1985. Because of her farm heritage, she was a life long friend to animals and supporter of local pet adoption, cats being her favorite. 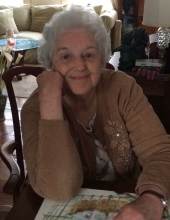 June was employed as a Registered Nurse at Lahey Hospital as a scheduler in the surgical booking department in Burlington for over 30 years, and had previously worked as a surgical nurse in the Glover Memorial Hospital in Needham, MA. June had a marvelous knack and thirst for knowledge, often showcasing it with her family and friends over games of trivial pursuit and Scrabble. Her love of trivia for actors and movies earned her the loving nickname of “June the original IMDB”. She also played mean hand of Phase 10. She is survived by her loving family members, Rosalind Beck of Princeton and James Rooney of Medway, Melinda and Jim Rooney of Westwood, and many loving friends. "Email Address" would like to share the life celebration of June E. Brown. Click on the "link" to go to share a favorite memory or leave a condolence message for the family.